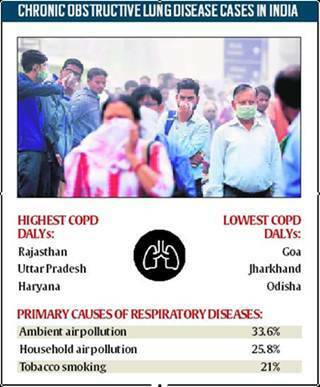 India has 18% of the world’s population but 32% of the global burden of respiratory diseases. Respiratory disease burden in India is second only to that of ischaemic heart disease, found a state-level analysis of the Global Burden of Disease data. Chronic respiratory diseases were responsible for 10.9% of the total deaths and 6.4% of the total DALYs (a globally recognised disease burden estimate calculated on the basis of the number of productive life years cut short by disease) in India in 2016. The corresponding figures for 1990 were 9.6% and 4.5%, respectively. Pollution was the biggest contributor to the respiratory disease burden. About 33.6% of COPD (chronic obstructive pulmonary disease) (DALYs) could be attributed to ambient air pollution, 25.8% to household air pollution and 21% to smoking. The National Health Policy of India 2017 recommends that premature mortality from non-communicable diseases, including chronic respiratory diseases, should be reduced by 25% by 2025. Cardiovascular diseases, on the other hand, contributed to 28.1% of total deaths and 14.1% of total DALYs in India in 2016, compared with 15.2% and 6.9%, respectively, in 1990. The prevalence of ischaemic heart disease in 2016 was the highest in Kerala followed by Punjab, Tamil Nadu and Maharashtra. Dr Sundeep Salvi, director of Pune-based Chest Research Foundation, who chaired the chronic respiratory diseases section of the paper, told The Indian Express that India needs a National Chronic Respiratory Disease Control programme to tackle this growing problem. “People will need to be made aware about the burden and risk factors associated with CRDs. We need to create focus on CRDs as part of the Ayushman Bharat initiative,” Dr Salvi said, adding that there was a need to develop community screening programmes, enhance infrastructure and skills at the primary and secondary healthcare levels to enhance early and accurate diagnosis and proper treatment, and ensure that drugs for asthma and COPD are made available at all public hospitals in India.